An intensive hair and scalp treatment that closely replicates the scalp's own natural sebum: the body's natural hair food. Philip B Rejuvenating Oil is a fragrant blend of carrier and essential oils derived from plants, nuts and flowers. Use on parched, damaged hair twice a week; on dry hair, once a week; and on normal hair 1-4 times a month. For a dehydrated scalp, use once or twice a week. 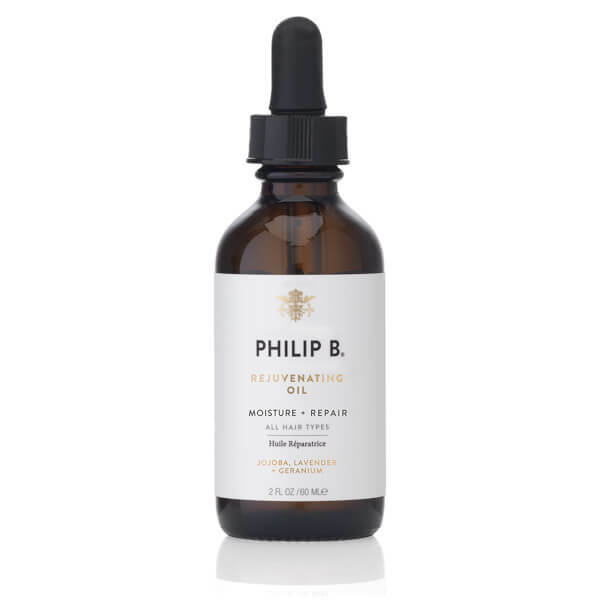 Apply Rejuvenating Oil liberally to dry, unwashed hair, starting two inches from the roots, and work it in with your fingers down to the ends. To help the botanical moisture sink in quickly, warm your hair with a blow dryer for one to two minutes. Dry hair: Leave on for 20-45mins. Dry to damaged hair: Leave on for 45mins-2hrs. Deep Conditioning: Leave on for 2hrs-15hrs. Use a clarifying shampoo to lift excess oil from hair shaft.